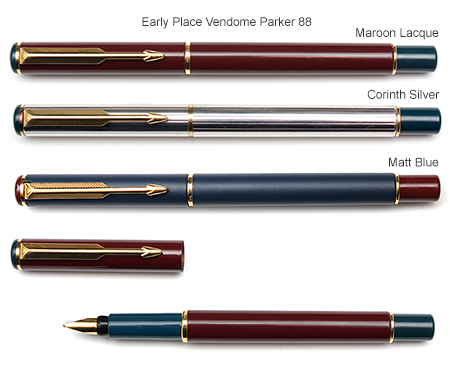 The Parker 88 was officially released in 1988 to coincide with pens name (although it was actually available to buy at the end of 1987!) and was designed to be a mid range pen that would appeal to those who wanted a more upmarket pen from the very succesful budget Parker Vector. Also known as the"Parker 88 Place Vendome" as Parker released the 88 as a tribute to the elegance of the Parisien Square. Earlier pens had coloured sections and end trims, the colours including dark blue, dark green and maroon with the very earliest models having a plain nib. 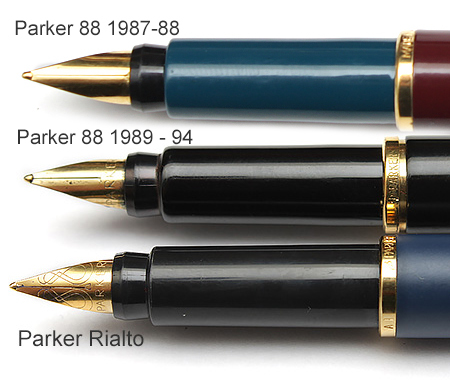 By 1989 the nib had PARKER engraved on it and in 1992 the coloured ends and sections were discontinued with all pens having black fittings. 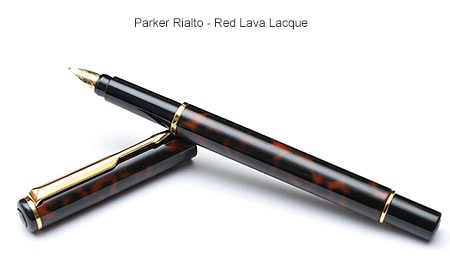 Towards the end of 1994 the Parker 88 name was changed to the Parker Rialto with a few minor changes made to the pen, including the word "Rialto" added to the body trim ring and the nib being engraved with a stylised 88. The Rialto is characterised by gold plated nibs and trim on the body ring and tail cap ring as well as a nice weighty metal body. 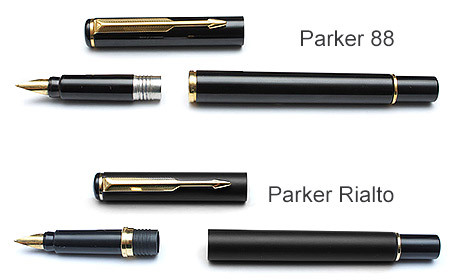 Earlier Parker 88 pens have a plain nib although after 1988 the word "PARKER" was added to the nib whilst the later Rialto pens had a stylised 88 as well. Bodies come in a variety of colours including the early "Place Vendome" series, gold and silver plated "Corinth" and glossy "Laque" as well as Matt colours. Eventually in 2007 the line was discontinued after falling sales, although the Rialto is slowly becoming more popular with collectors, particularly the older Parker 88 Place Vendome versions.